~ About ~ | MMSB = My Mental Scape, Baby! Hello! And welcome to my mental scape. My name is Michelle. I am an entrepreneur who stays-at-home (SAHM) with her kids. At the moment I am the mother to 2 very active boys, Connor will be 8 in March and Sam is firmly 3 1/2. Number 3 is on the way, due in mid-July and promises to bring more joy and madness to the halls of my chaos. I can’t wait! No really, I can’t. I am one of 3 myself and I think I had a lot of fun with my 2 siblings and I’m sure that this will be true for my kids too. I’m also happily married to the man of my dreams (MOMD) for coming up on 12 years now. Where-o-where does the time go??? 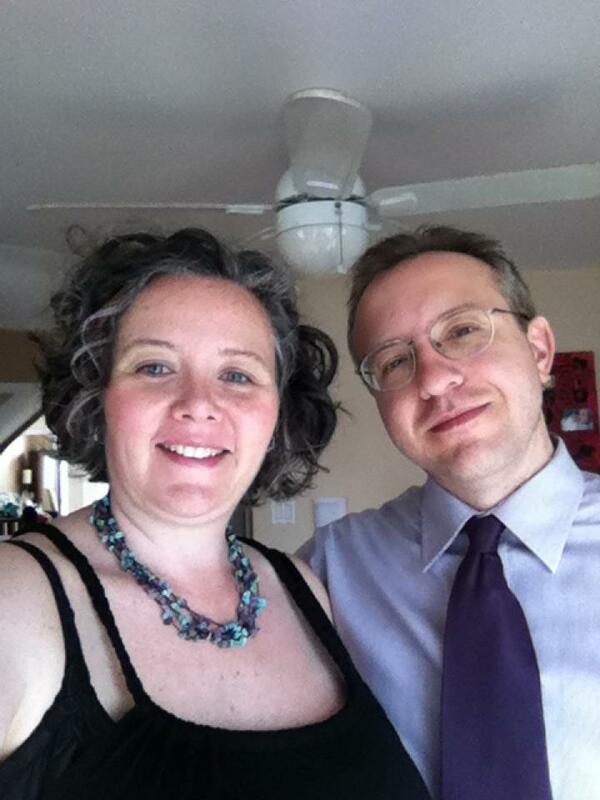 Self-snapped picture of MOMD & me, dressed and ready for Easter dinner in 2012. I started this blog because sometimes I have thoughts. On occasion, these thoughts are insightful thoughts, from time to time they are crazy – I will attempt to chronicle my gradual descent into madness with humour, I hope – and frequently, just random thoughts. I started feeling that I needed to express these ideas, since adult time for this SAHM can be in short supply. I love to read blogs (check out my blog roll for some of my faves) and I’m a fairly decent writer I like to think and so, here we are, wandering through the halls of my mind.